A scream from the bowels of hell opens Horns used for Butting from Tasmania's Diable Amoreux. Forced to come up with a succinct description of this sound, I believe the scorned child of Rob Zombie and Nick Cave with some mothering from the Dresden Dolls might come close and yet...their self description of "gnomic gothic folk from Van Diemen's Land" is possibly more appropriate. Theatrical and ghoulish, the effect of this album is similar to that of a circus clown. Some people love clowns and they fill people's hearts with glee and wonder. Other people have nightmares of clowns with little pointy teeth and glowing red eyes, ready to tear their hearts out in their sleep. A little afraid of clowns myself (only since 'Poltergeist', a word ironically used several times in the lyrics) this album both frightens and enlightens me. The music is very creative, using myriad delicate instruments and haunting melodies to create a complex narrative of love, death and history. Tin whistle, ukulele, violin, and "dog lifting" (?) combine to weave musically intricate tunes that warp into a crazy half cabaret-half circus tale of woe and darkness. I especially appreciate the vocals on "In Van Diemen's Land" by Vicki Brooke, and the guitar in this song is spellbinding, dramatic, mesmerising. To get inside her when no one else has dared, the fact that I exist will have her quite scared". Yes, this is a love song and typical of the darker qualities of desire highlighted throughout the album. On many levels, this music actually touches me artistically. I find that, when I listen to it, I feel the desire to paint, to write, to create. And to me, this is quite an achievement. 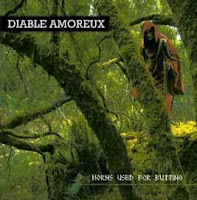 I'm uncertain as to why I am so impressed with "Horns used for Butting", but I can highly recommend this album to anybody with an open mind willing to try new sounds and dark scapes. Sometimes darkness is quite chillingly intoxicating.